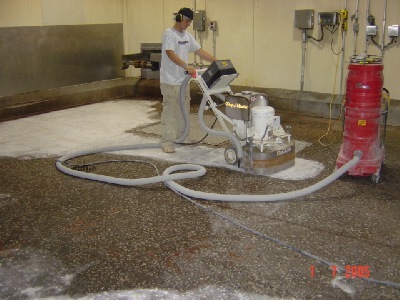 Shot blasting and diamond grinding are two ways of floor preparation. To get a coating to hold properly you need to create a mechanical bond, which shot blasting and diamond grinding provide. (We do not recommend acid etching for floor preparation.) Shot blasting is a process that uses steel shot to get the needed concrete profile. 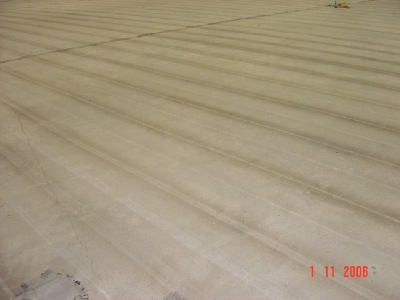 The floor preparation step is the most important step in the coating process. For a coating to fully bond to a concrete surface, you must have the proper profile. Once this process has taken place, the concrete would be ready to accept a floor coating to finish the job. We prep our own floors, but we also prep floors for other applicators. Whether you are installing floor coatings, carpet or tile, we can assist you with your floor prep needs. Diamond grinding is another way that we prep our floors. Diamond plugs are used to rub the concrete surface to clean and whiten the concrete. Rubbing in a circular motion, our grinders also can be set up to polish concrete. An added bonus to diamond grinding, is that your finished surface is much smoother and flatter than a shot blasted floor. This is ideal for resetting of tile, or thin mil roll-on coatings. Also related to floor preparation is our concrete repair. We can take down uneven slabs of new or existing concrete that has heaved up or curled joints. These issues can make tile setting or carpet laying nearly impossible. We do all of our floor preparation in a dust free environment which accommodates food factories, health services, or simply finished work spaces. 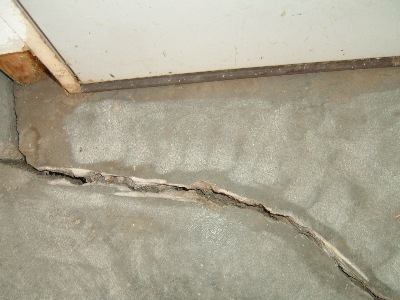 We can repair unsightly cracks such as this with various methods depending on your specific needs and uses. It is our opinion, that having the ability to properly fix, fill, or repair joints, seams or damaged concrete, can make all the difference in the appearance, function, and durability of your finished floor.